Freckles, I have missed you too. I have been real busy and have got involved in other projects on a local level so therefore, I don't have much time to be on the computer and blog any longer. All is well and I hope all is well for you too. I truly miss Valhall and The Hinky Meter days! She was an amazing, intelligent lady and brought attention to the cases where "something was just not right" --- hinky! And of course, the folks that blogged there were very intelligent and a pleasure to share theories with as well as communicate. I also miss Justice4All (J4A) that devoted so much of his time to developing this site and did a remarkable job of modifying and designing so many features to accommodate the many folks from The Hinky Meter that came here when Val shut down her site. I think of him often and hope all is going well for him and his family. J4A's dedication to this site and the cases involving children (missing and murdered) as well as some adults was truly remarkable. I hope one day that he will be able to be active here again. I do understand that his wife and children come first and that is the way it is suppose to be! Because of John Goodman's ties to Houston, TX, I am most interested in this trial. Yes, it may seem boring at times, since we already heard this testimony once before. I do wonder if Goodman will testify this time. He and his "man cave." LMAO! What a hell of a drunk to come up with such a bizarre defense! It is just so sad that because of Goodman choosing to drive his Bentley drunk, Scott Wilson lost his life. I shutter to think of the horrific, slow death Scott had as he drowned in that canal! Such a young recent college grad had his entire life ahead of him and there is no telling what kind of greatness Scott could have achieved in his life time .. . .. but that was all taken away by a drunk driver: John Goodman! He deserves to spend many years in prison and I do hope this jury finds him guilty and he gets the maximum sentence. Okay .. . rant over! Freckles, thank you for all of your updates. I won't be able to watch every day of the trial and hope to be able to read updates here and in mainstream media. I wish a TV station in West Palm Beach was archiving this trial like WRAL did in the Jason Young trial in SC. That retrial should be coming up soon. Now that is one trial I definitely want to watch again! Pembleton says Goodman said the same things over and over. That he was in a bad accident and hopes no one was hurt. Goodman asks 911 operation: Is everyone okay? What happened? He said to operator he had pulled over and stopped. He tells operator his current location. He said he walked directly there---- omitting the stop for the alcohol. He earlier asked Pembelton if he sounded okay and told her he had a few too many to drink; a LOT too many; felt like this was the end of the world. "I did not see another car but obviously hit something" Goodman said in 911 call. Of interest, JG did not state something hit HIM. He was clearly aware HE had HIT another. Listening to the 911 call: JG is lucid enough to answer each and every question by the operator without asking her for clarity or to repeat her question. His current claim of being knocked unconscious has to be found to be bogus. After JG lefty in PD car, Lisa Pembelton walked down to see what was going on. She took pics of Scott Wilson's car being pulled from the canal. She said officers appeared troubled. She went back to her domicile. Heard the sounds of sirens and saw light reflections of arriving PD cars. Witness Lisa P mentions a few days after the incident there were four men she saw at the barn. They had entered from the back of the barn. One of them was JG. He had a cast on his wrist. Lisa was with another horse trainer. That horse trainer took one of the men over to a second trailer and they had a private conversation. This means JG and co were already working up his story and needed the details re the property.... !!! Wow. Talk of being guilty. Def is trying to get ot on the record JG asked to use Lisa P's cell phone TO CALL 911. She does not recall. IF that were the case, why did he first place SEVERAL calls to "Carlos" ? Freckles, I caught that too. John Goodman wasted no time in laying the ground work for his story .. .. . his so called defense. It will be interesting to see his "bimbo" girlfriend testify again. I am trying to locate the time when the first witness at the street scene called 911 and then what time JG placed the calls from the horse farm. Do you know of a time line for those calls? I had hoped the times would be mentioned. I recall JG getting busted for trying to remove the ankle bracelet off his ankle!!! Oct 13: Oscar P's sentencing to be announced by judge. Set you clock as there is a huge time difference! Oct 14: Another try to get the Bob Bashara case to trial after Joe Gentz refused to testify for def last Friday. One of those dates we got Jodi Arias trial starting up for the sentencing phase. That is a messy case. Then again, from what I have "heard" Judge Stephens is a former juvi/family court judge and this is her first death penalty case. Seems like a bleeding heart for the perp, JMO. It has been a long time since we've watched a trial together! Thank you so much for your posts. So good to see you! I've been gone for several months and it is really nice to "see" folks again and say hello. One Wonders and Curious, also so good to "see" both of you again. All of us have spent a lot of time together, in the past, blogging about various cases and trials. It's so good to see you too Ann. I hope everyone comes back like AD, Ishi and Nan. It been such a long dry period that we have gotten lazy in keeping up with each other. AD and Ishi do come in when they can but they are so busy that we don't get to see them as much as we'd like. Now if we could just get a really good juicy trial that we could actually watch we'd be in business again, lol. Freckles, I found some videos on YouTube that might be helpful. I know this is "way ahead" of the trial but I just have to post the video to John Goodman's testimony from his first trial .. . .
to refresh our memory of what kind of person he is. . .. .. . Testimony was on 3/21/12. One Wonders, I think if we had a real "hot, juicy" trial to watch, many would come back! Thanks for the update on AD and Ishi. I have not seen Nan in a long time. The Jason Young retrial should be coming up soon. Maybe that will draw some of the trial watchers back. But . .. it is his third trial so I don't know if there will be a lot of folks still interested. I will be watching that trial and the wonderful thing is that WRAL in Raleigh, SC does an exceptional job of archiving each day's testimony. He's a sleaze ball too .. . womanizer . . . who slept with his wife's best friends! Does not say much about her friends either! Freckles wrote: I recall JG getting busted for trying to remove the ankle bracelet off his ankle!!! Yes, Freckles! Goodman was busted. Here is a Link to an article and video. Excellent video and pics of Goodman's "handi-work" are also shown. 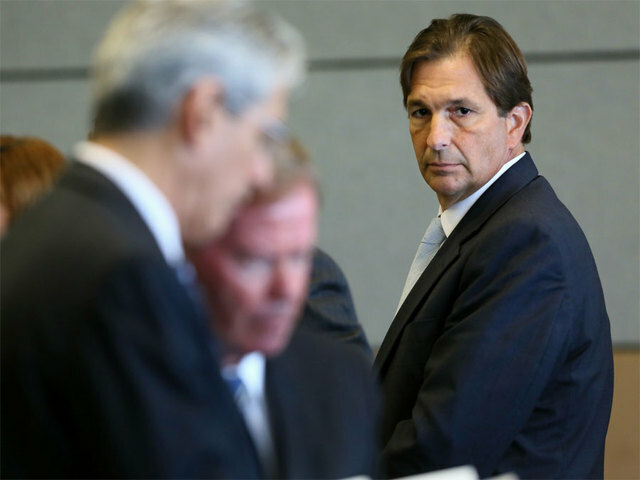 John Goodman's highly-anticipated DUI manslaughter retrial started Saturday in a near empty Palm Beach County courtroom, with attention shifting quickly from the unusual selection of jurors in Tampa to a sharper focus on what the panel will see and hear over the next few weeks..
After spending their first night at an undisclosed hotel, the sequestered jury heard wildly different accounts from the lawyers about the 51-year-old Wellington polo club founder's case. Only one point was in agreement: the Feb. 12, 2010 death of Scott Patrick Wilson, a 23-year old University of Central Florida engineering graduate, was a tragedy. Chief Assistant State Attorney Alan Johnson told the jury Goodman was drinking and partying at three bars over several hours before he drove his Bentley Continental GTC convertible and slammed into Wilson's Hyundai Sonata at about 1 a.m.
Goodman walked away from the crash and didn't call 911 for about an hour, and after Goodman's blood was drawn at 4 a.m., the results showed a blood-alcohol level of .177, more than twice the .08 legal limit to drive, Johnson said. But defense attorney Douglas Duncan said Goodman was "neither impaired nor intoxicated" at the time of the crash. He spoke of how the Bentley malfunctioned just before impact, and was "prematurely" released from evidence by the state. And Duncan said soon after the crash Goodman drank liquor at a "man cave" — a second-floor office in polo player's nearby barn — revisiting a defense used at Goodman's first trial in March 2012. There were no fireworks on day one of the John Goodman retrial. Opening arguments were relatively low key. Prosecutor Al Johnson told jurors the polo mogul got drunk and left Scott Wilson to die after hitting him with his Bentley. "Scott Wilson did not have head trauma. Scott Wilson's lungs filled up with water and soot and he drowned," Johnson said. But Goodman's defense attorneys say it was a terrible accident. Attorney Doug Duncan told jurors in opening arguments they would prove three things: that Goodman was not impaired when he crashed, that his Bentley malfunctioned, and that Goodman was seriously injured during the crash. DUI manslaughter in the death of Scott Wilson. As the John Goodman DUI manslaughter retrial moves into the evidence stage, the week selecting jurors in Tampa remains a clear memory as much for the arrest of one juror who Googled information about the trial as for the many unusual characters populating the original pool of 220 jurors. Palm Beach Post courts reporter Daphne Duret, who covered Goodman's original trial in 2012, captured every minute. Here's her choice for the Top Five Most Colorful Characters in the Courtroom this week in Tampa. As of 10/11/14, there are 17 photos. It is my understanding that Lisa Bloom, Attorney, with appearances on NBC and other shows, will be a guest on NBC's TODAY show Sunday, October 12, 2014. She supposedly tweeted that she will be on the show to discuss how John Goodman's wrecked Bentley "went missing." TODAY is on NBC ...on Sunday, it is at 7 a.m. CDT/ 8 a.m. EDT. It is an hour show on Sunday. For those who have followed this case, we know that the Bentley as well as Scott Wilson's Hyundai were released by the Prosecution - State of Florida (after the conviction and sentencing of John Goodman). The Goodman Bentley, with about 14,500 miles on the odometer, was placed in an auction with a $25,000 starting bid, court records show. In June 2012, Chubb received a final check from an auctioneer in the amount of $27,737. It's not clear who bought the car, but in July 2013 it turned up on the auction block again. That's when Manahan says he bought it online from Copart, Inc. for $11,000. As Goodman's new attorneys began preparing the defense in his retrial, Manahan was having the Bentley shipped to his home in Sugar Land, a city of about 84,500 people located 20 miles southwest of downtown Houston. Manahan runs a company that audits managed care claim payments for hospitals across the country. Manahan says he bought the Bentley with the intention of using it for parts for another side project: restoring a 2010 Bentley he acquired a few years ago. To Manahan's disappointment, he discovered a number of parts from the Goodman Bentley were missing and others were not compatible with the newer model. Then Manahan decided he would restore the Goodman Bentley: "I'm going to fix it and keep it. I have the patience, time and money." It needs a ton of work. There is severe front-end damage and the hood is missing along with numerous components. The interior is a mess too; Manahan removed the seats because of damage from the windows being left open for years. It's great to "see" you, too! You were noticeably missing for a while there, so I'm glad to hear you are OK and doing well. Thank you for keeping this thread so up-to-date. That article about the 5 most colorful characters was a riot! Thanks! An interesting read .. . . Being knowledgeable about this case and familiar with John Goodman, I found no issues with this info provided by Wiki. Hhmmm, I wonder if a John Goodman "fan" wrote the comment(s) about this info having 'issues'. WPTV - West Palm Beach, FL -- Includes tweets by Brian Entin, Reporter - WPTV, to the right of the video screen. WildAboutTrial - John Goodman Trial "Live Stream"
If anyone knows of other sources that are streaming this trial or tweeting, please post the Link. I will add to this list. Thank you! WEST PALM BEACH, Fla. —The first moments of the John Goodman trial got off to a bizarre twist when juror number 10 told the judge she had been heckled at her hotel two nights in a row by unknown people standing by the pool. The juror said the first night she was on her balcony and heard someone yell toward her “Watch out, you’ll go to jail like Van.” The second night she heard them say “You’ll go to jail like Van Fleet,” a mispronunciation of Travis Van Vliet, the prospective juror who was jailed in Tampa for contempt of court for Googling words in the trial. Was the juror having drinks on the balcony? This is a very strange trial, to say the least. I'm afraid John Goodman will walk free, I hope I'm mistaken and there is a some semblance of justice for Scott Wilson, but there are several aspects of the trial that make me think this way. I'm in chat if anyone wants to join me. In Wellington polo impresario John Goodman’s new trial, a judge is considering lying to the jury in the new trial. 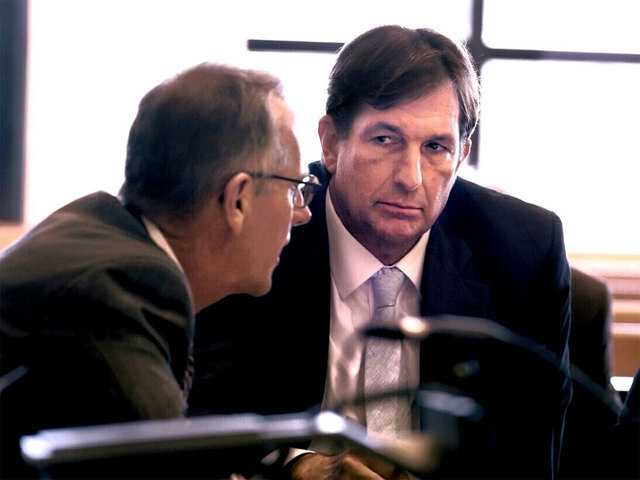 Deceiving jurors – telling them a “fiction,” as Circuit Judge Jeffrey Colbath puts it – may be the only way, as the judge sees it, to guarantee Goodman a fair trial. ...To dance around this issue, Colbath had been weighing two solutions: telling both sides to refer to the previous trial as a “hearing,” or calling it a trial that never reached a conclusion. Neither version is quite accurate. A trial is hardly a hearing, and it’s highly disingenuous to say that it never reached a conclusion, given that Goodman was found guilty. But as The Post’s Daphne Duret reported, Colbath doesn’t see any alternative. “No matter which way we go, we’re going to have to create some fiction here,” the judge said last week. Alessandra_Deux wrote: Was the juror having drinks on the balcony? Nice share, CP. Rather ominous. A catch=22, IMO. If the judge mentions the first trial, might be grounds for a successful appeal. If the judge fails to mentions the first trial but lies and calls it a hearing, another mistake on his part as it would be ....grounds for appeal when a judge lies about factual info. IMO, the judge should probably have recused himself for the retrial; totally avoided mention of this being a retrial; gotten a stipulation from the def/state as to the wording of instruction for the jury.... At this point, being stubborn and argumentative WILL play out nicely for JG. As AD posted above, I fear he just might be able to wiggle out of the future penalties and his responsibilities for killing Scott Wilson. His new trial started Saturday, with Goodman again pleading not guilty. The multimillionaire founder of the International Polo Club Palm Beach claims that his $200,000 car malfunctioned and lurched forward, slamming into Wilson's vehicle. He has also denied being drunk at the time of the crash, although other testimony has contradicted him and his blood alcohol level was 0.177, more than twice the legal limit three hours after the crash, according to prosecutors. Goodman fled the scene of the accident, authorities said. ABC News Chief Legal Affairs Anchor Dan Abrams said he’s not surprised there’s a retrial in the case, and that the judge is intent on making sure the jurors are not influenced by media coverage. John Goodman's girlfriend Heather Hutchins took the stand Monday claiming Goodman was hurt so badly after the crash she went with him to the emergency room. "He was dizzy and nauseous. That night at the hotel I had to physically assist him to the restroom because I thought he was going to fall down," Hutchins said. John Goodman's drunken driving manslaughter retrial continued Monday with emotional testimony from a crash witness, a composed girlfriend revealing new information about Goodman, and a bizarre juror revelation about alleged hotel hecklers. Gone . . . but not forgotten . . . . .
May justice be yours, Scott! Scott Wilson of Wellington in a photo provided by his family. Wilson was killed in a crash near Wellington on Feb. 12, 2010. As of this date and time, there have been 1,065 "hits" (Views) on this thread! This older article, with video, regarding the adoption of John Goodman's girlfriend is dated March 27, 2013. Today court starts at 1:30 pm EDT/ 12:30 CDT. Major witness on stand now. The only head injury he suffered was the result of a massive hang over, IMO. He had no time to have hit his head and been knocked out at the scene. Does not fit a time frame....and he would have still been at the scene when the first call went into 911 from the woman who came upon the crash scene. There were people out and about that night. He is trying to blow a smoke screen, IMO. At the hospital: Was there evidence he had injured his arm? He did NOT indicate that or the head injury at the horse farm, did he? No. When did he decide to concoct these alibis? Was it after he met with the attys? Who he thot he should possibly call before he called 911? Thank you for posting this, Ann. I've never seen a picture of him before. Thank you again; I was just wondering what happened with that adoption attempt. Must be nice to have $46 million to spare.